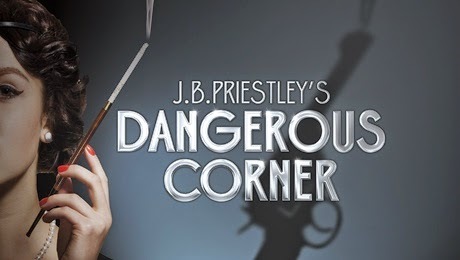 As far as playwrights go, J B Priestley certainly must rank amongst the more famous and popular following productions of "An Inspector Calls" in the last few decades and this new touring production of "Dangerous Corner" is a solid presentation of what was his first attempt at writing for the stage. Its plot revolves around a group of well-to-do people at a social gathering whose lives start to unravel when uncomfortable truths begin to emerge following the painful revelations of lies and deceit concerning the theft of money and the resulting suicide of someone close to all those present this particular night. Upon entering the auditorium songs of the period are heard and the audience are confronted with an elegant set whose angles belie its outward appearance: Something perilous lurks under the outer façade of respectability. Gary McCann is responsible for the design and his costumes are also gloriously realised whilst the effective lighting is by Tim Mitchell. Direction by Michael Attenborough is suitably moody and heady though static at times and the pace could be improved upon in places whilst the sometimes heightened performance style is a little inconsistent. The cast are generally strong with each actor confident in his or her role and this includes Rosie Armstrong and Susanna Herbert who, on this occasion, covered the roles of "Olwen Peel" and "Miss Mockridge" respectively. As "Robert Caplan" Colin Buchanan is a little clunky at times although this may be down more to direction than the actor's choices. Finty Williams as "Freda Caplan" is spirited, lively and hugely entertaining whilst Michael Praed as "Charles Stanton" is the most natural with Priestley's text and the most physically at ease and is thus perfectly suited to his character who has some of the most funny lines which Praed delivers effortlessly and dryly. Altogether this is a sound production which, following a slow start, soon gears up toward a most intriguing climax.